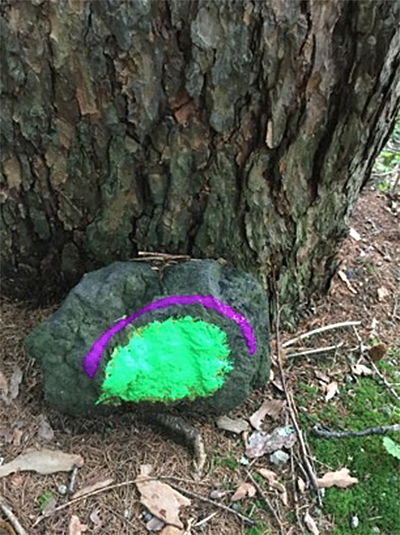 To grow into a great rock and be covered with moss. 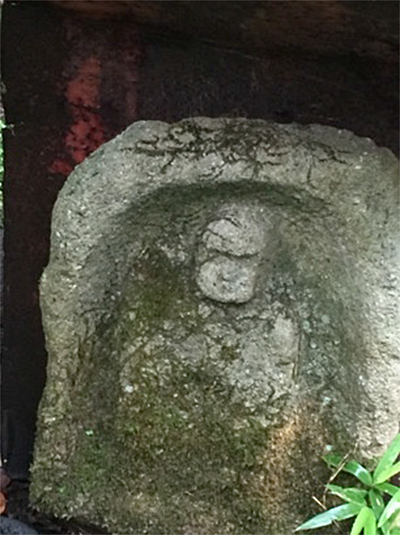 Stones are objects of worship in Japan. 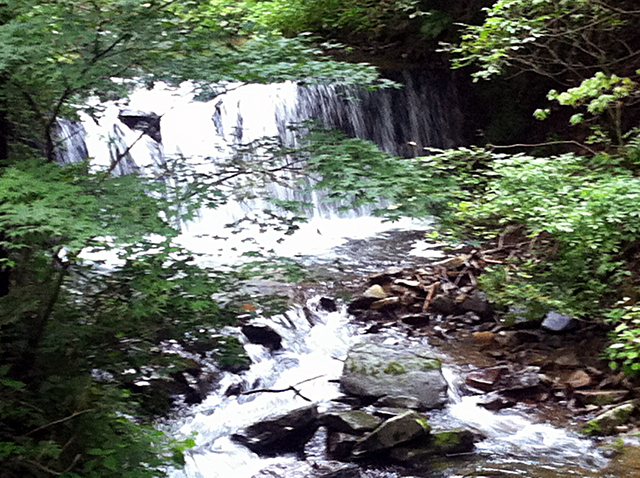 Stones and water, trees and mountains are all thought to posses the same spirit of ANIMA as people. They share a divine force that gives them vitality and humanity according to Shinto beliefs. 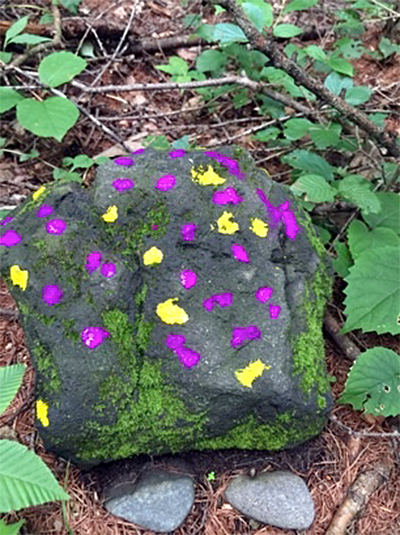 Stones in nature are sometimes marked, sometimes stacked, and sometimes quietly honored for the spirit they possess. 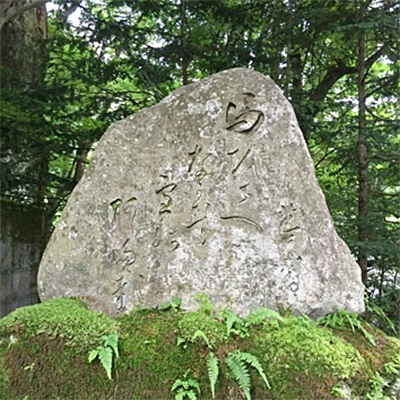 Stones are sometimes incised like this tribute to the great 17th century haiku poet Matsuo Basho, (named after our black dog?!) who walked through the deep north and wrote the poems included in his classic The Narrow Road to Oku. 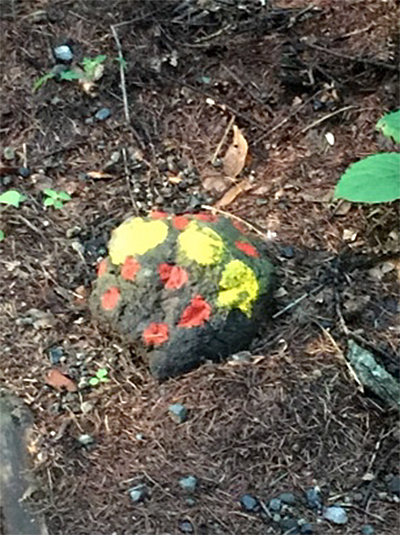 This handsome rock sits above the old village of Karuizawa incised with his beautiful calligraphy. 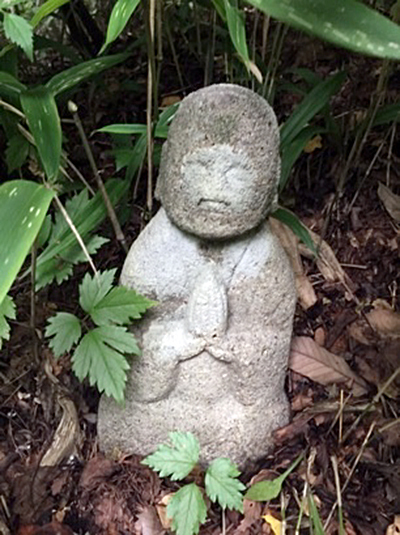 Not far away, these classic sages stand guard by a graceful river and invite meditation, contemplation and the peaceful thought that rivers inspire. 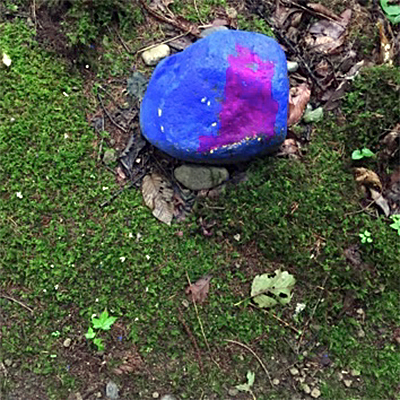 Stones inspire deep thought. 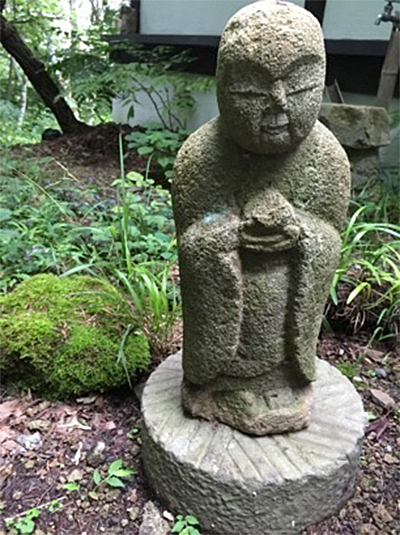 This Jizo san in the garden welcomes people to the house and invites them to share his gentle calm. 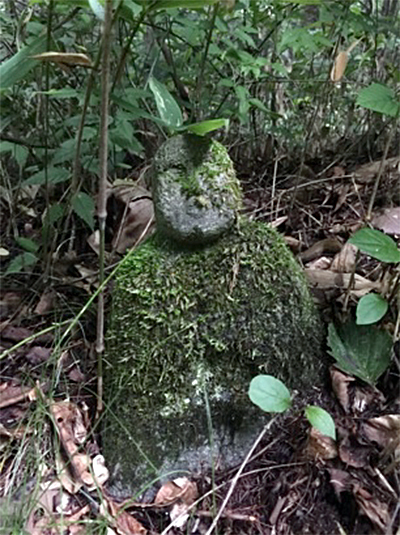 Another saintly stone kneels in prayer in his bamboo nest and wears the changes of seasons in silent acceptance. 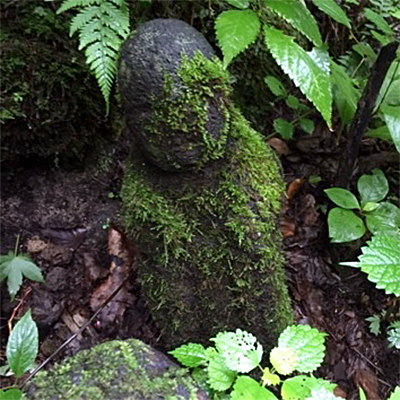 A new green cape of moss has grown around this saint in prayer. I hope it will keep him warm in the cold snowy winter. Receiving thought filled inspiration from above. What would they teach us? Stone mystery deep in thought. 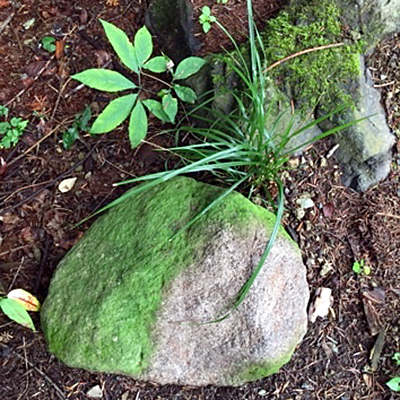 green coats of moss in the rainy days of summer. Beautiful moss! Nature’s own design. 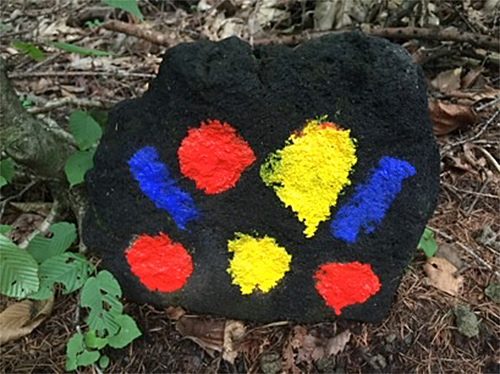 Children try their hand at rock painting – an old tradition in Japan. 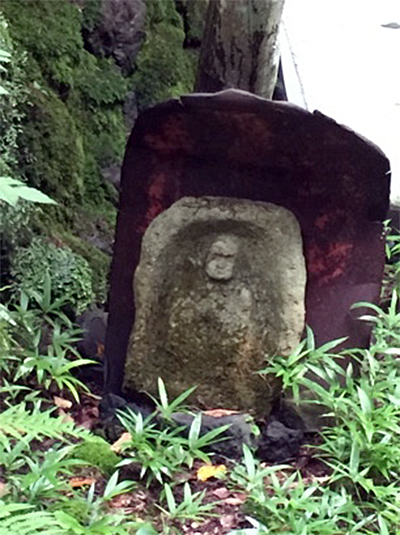 In Kyoto the stone gods in roadside shrines are repainted every year and given bright new faces and make-up. 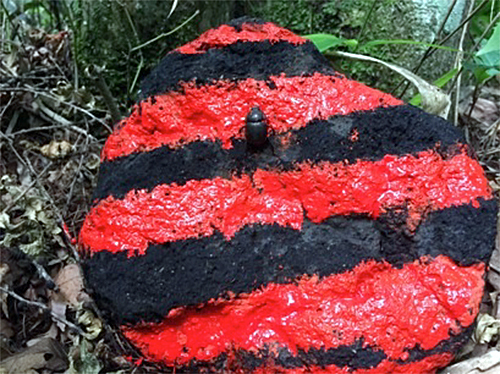 This bug seems to enjoy the brilliant fresh colors. Stones point the way to our house in the woods. 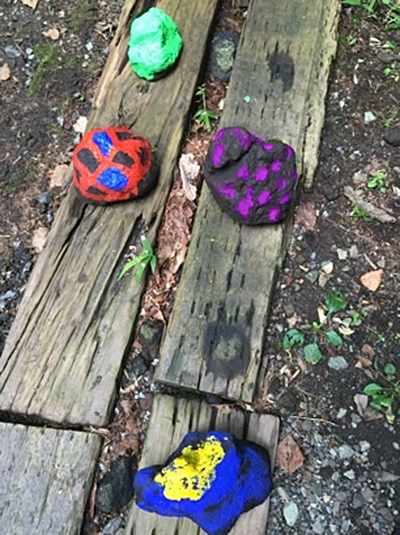 Stones provide a shapely canvas for young people with rich imagination and the free thinking lively colors can encourage. 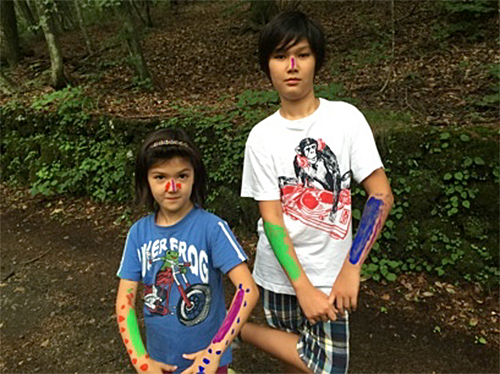 The clever artists finished the day off with some wonderful body painting. 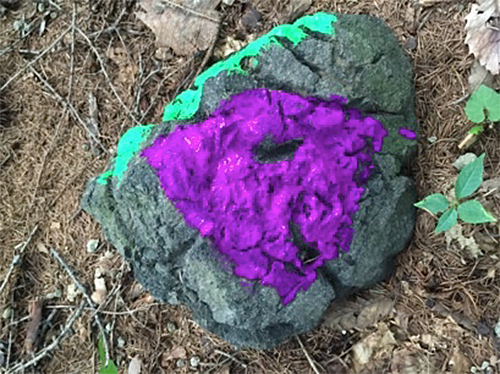 Small stones seem to have a character within that can be drawn out with paint. 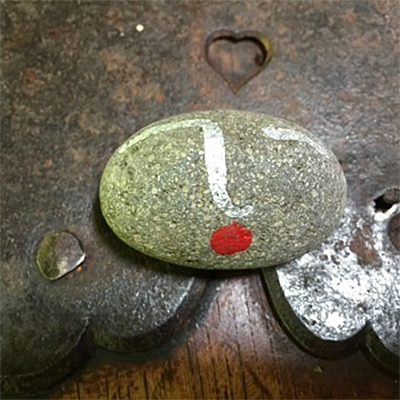 Sometimes small stones serve as chopstick rests, sometimes they are simply for smiling. 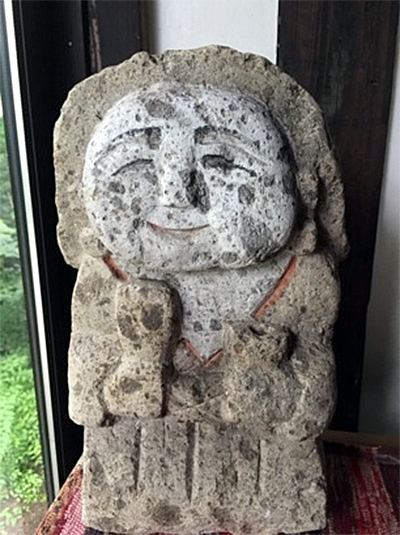 Stone statues dot the land and provide places for farmers and townspeople, mountain men and seamen to press their hands together to pray. 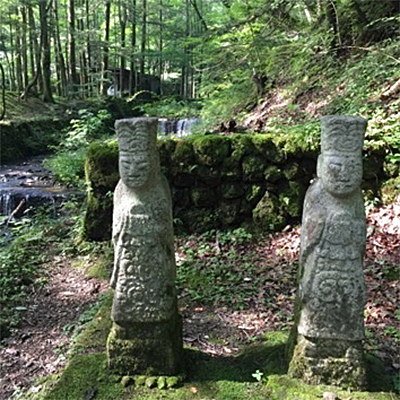 Yesterday as we were driving to Saku in Nagano Prefecture for supper, we passed by a stately triad of tall stone Shinto saints. They gave out an aura of godliness that I couldn’t miss in passing. After centuries of standing there, they still have power and protection to give to passersby. 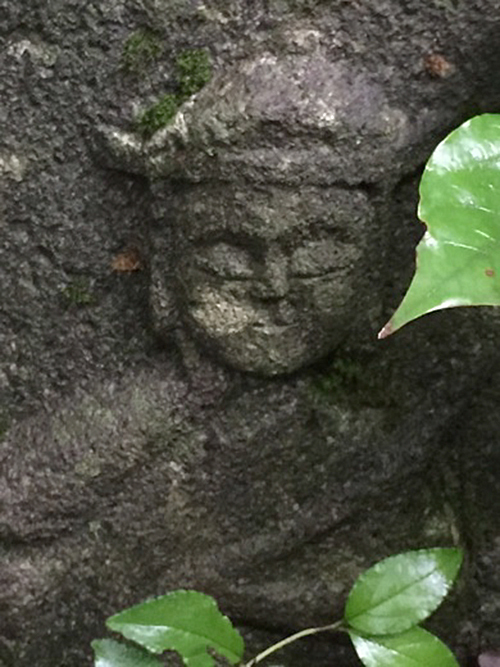 Ta No Kamisama, are Gods of the Field who overlook the wellbeing of the crops and those who grow them. They used to be seen everywhere, but have steadily disappeared into the trucks of antique dealers, no doubt, as the fields are no longer farmed as religiously as they were. 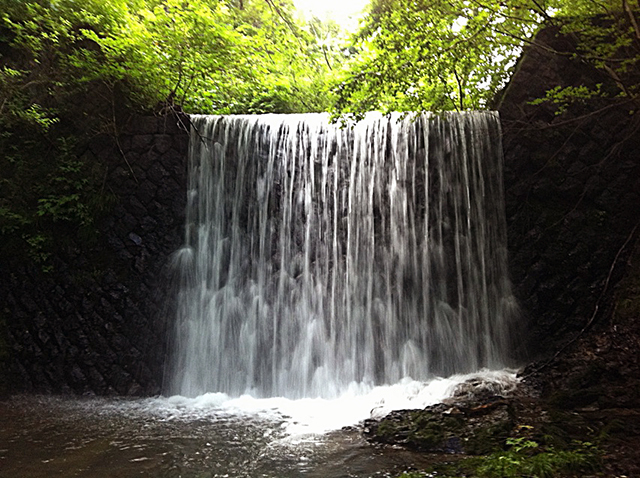 In Kyushu, Ta No Kamisama, above, often hold rice paddles invoking a fertile harvest. 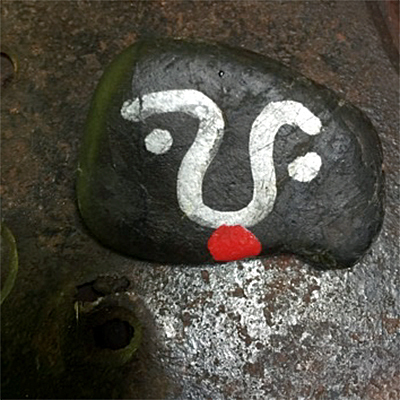 Other stones are not so easily identifiable. I simply treasure them for their warmth, their compassion, their humanity. 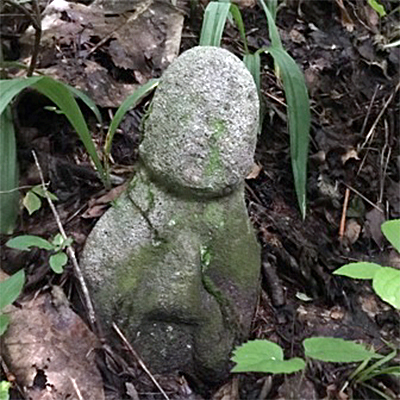 Although in the Shinto religion, human images are not frequently represented, when they are they have a vitality and compassion to them that I for one can easily relate to. Their presence gives reassurance of eternity and peace in a world of endless change turmoil. 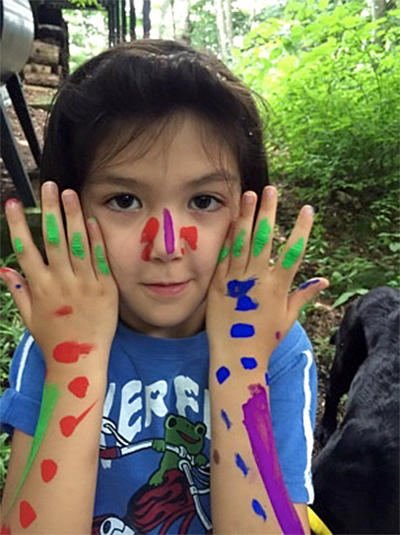 The peace is even conveyed by e-mail…Thank you for a beautiful, thoughtful start to my day! Beautiful, all of them. 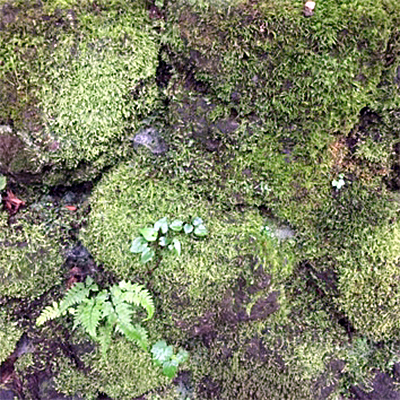 The moss is luminous, even in photographs you can see the glow it gives off. 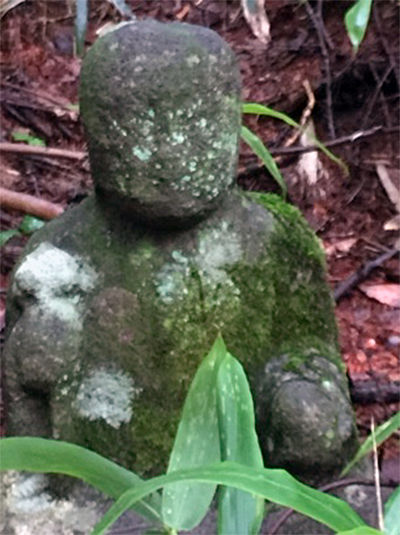 The Jizo statues are my favorite.